Whether you’re interested in adding just a few plants to a small office or are in need of full-scale plantscaping for a large event, we can help! Contact us and let us know what you envision. We can work with any budget and often surprise our customers with our reasonably-priced proposals. We can offer a solution as we guide you through the process of selecting plants for your interior landscape. 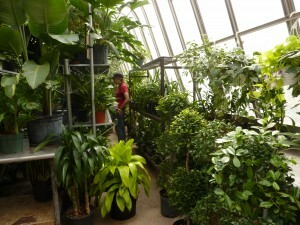 Our greenhouses are stocked full of plant materials ranging from 4″ pots to large 24″ planters and trees up to 20′ tall. Many varieties are available, including unusual tropical and hardy species, so that all types of existing interior conditions can be accommodated with suitable plants. All of our plants and flowers are acclimatized in shade-grown conditions and held in our facility until they are ready for delivery. Visits to our greenhouses are offered by appointment so that you can browse all that we have to offer, or feel free to view our gallery of plant selections to get an idea of some of the foliage, trees, and exotic plants and flowers that we can suggest for your location or event. To select suitable plants for particular areas, we first help you assess the location in which the plants will be used. We consider light levels, available space, and the desired effect and make recommendations based on these considerations so that you have the ideal presentation for your installation. We measure light levels from low to high and determine whether fluorescent, incandescent, or task lighting is predominant in the area. Direct sunlight, dark conference rooms, and ventilation types are also considered as they also play a part in potential plant selection.